Ever wanted to tell other users you changed an appointment or ask someone to get out of a record? Now you can with Troi Activator Plug-in! The Activator is a very powerful tool for triggering scripts across the network, even over internet! 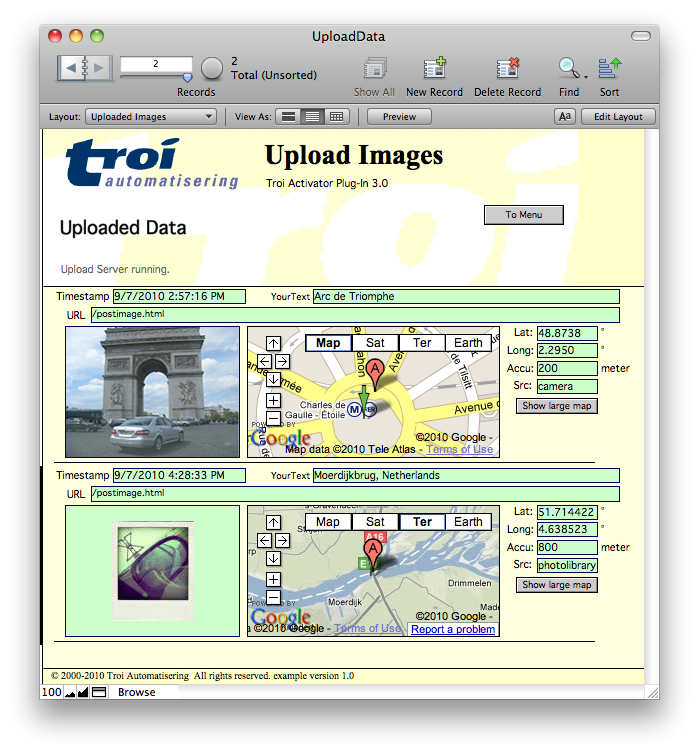 Troi Activator Plug-in can serve as an Image Upload Server. It can receive uploaded images including GPS coordinates. With the GPS coordinates a location on a (Google) map can be shown. You can use this functionality to easily upload data from remote devices. More details on the Image Upload Server page. Activator Plug-in can trigger silent events and background events. This allows you to keep the main application free, while the background FileMaker application, for example a runtime application, does some time consuming work on data. Troi Activator has a control function to disable all script triggers, so you can do maintenance on the database. You are free and invited to test the plug-in before you pay. Troi Activator Plug-in is fully functional in demo mode, it will only stop working after 2 hours of testing. Download your copy here. Troi Activator Plug-in 4.5.1 is a maintenance update which fixes a crashing problem on Mac OS with installing or disabling the plug-in. Note: if you have installed version 4.5 you need to remove the plug-in manually before upgrading to version 4.5.1 to avoid the crashing. See instructions how to manually update Troi Activator Plug-in 4.5. In this version we also improved the type-ahead of external function names. Upgrading to version 4.5.1 is free and recommended for all users of version 4.5. Please see the Version history below for a complete list of changes in this and earlier versions. (Mac OS) Fixed a crashing problem with installing or disabling the plug-in: FileMaker Pro no longer crashes when disabling the plug-in. Note: if you have installed version 4.5 you need to remove the plug-in manually to avoid the crashing. See instructions how to manually update Troi Activator Plug-in 4.5. (Mac OS) Fixed a compilation problem with code signing and extended attributes in Mac OS 10.12 (Sierra). Improved type-ahead of external function names. Rewrote and modernized the code in several places. Added namespace handling and improved the internal registration of function calls to make the plug-in more robust. (Mac OS) Added code signing to the plug-in. (Mac OS) Improved export of symbols: now only the symbols that are required are exported by the plug-in. The Activator Plug-in adds multiple script steps when running FileMaker Pro 16. NOTE Only steps that perform an action have been added as a script step. Functions that have no side effect (like for example Actr_GetIPAddress) are only available as an external function. Added new scripts to the RemoteTriggers.fmp12, ScheduleTriggers.fmp12, ShutdownRestart.fmp12, Sleep.fmp12 and UploadData.fmp12 example files, to demonstrate how to use the new external script steps of FileMaker Pro 16. The examples check if FileMaker Pro 16 is running and will then select these new scripts. Fixed a possible memory leak when receiving messages send by the Actr_SendRemoteEvent function. (Mac OS) Fixed a bug in the Actr_SendRemoteEvent function, which in some cases could cause a crash. Fixed a bug in the Actr_StartListener function: when you receive a remote message the yourText text could contain an invisible ASCII null character at the end. (Mac OS) Fixed a bug which could cause a crash when quiting FileMaker Pro. Fixed a bug in the Actr_RunScript function, the plug-in now returns an error code if the script did not trigger. When the database name does not exist error code $$-4232 (kErrNoSuchDatabase) is returned. And when the script name does not exist error code $$-4233 (kErrNoSuchScript) is returned. You can now schedule up to 1500 events to trigger, up from 1000. The type-ahead information is used by the auto complete functionality of FileMaker Pro 15. In the calculation pane of the Specify Calculation dialog box you can type a letter or two of the function name and instantly see a list of matching function names. For example when you type “sch”, the auto complete functionality will suggest the Actr_ScheduleEvent function. You can also type a function name in the functions pane on the right: for example if you type “HTTP” you will see all the functions with HTTP in the name, like Actr_StartHTTPServer. Updated the UploadData.fmp12 example file: it now correctly shows a Google Map in a webviewer. Fixed a possible memory leak in the HTTP Server when receiving GPS location data. Fixed a typo in the web page of the http server. All licenses work both on Mac OS and on Windows. Version 4.5.1 uses the 4.5 registration code. If you have a license for a previous version, you can buy an upgrade for version 4.5. If you bought a license for version 4.0 on or after June 14, 2016, the upgrade to version 4.5 is FREE! Note: eligible users have been sent a new 4.5 registration. Contact us if you have not received yours. “I needed a reliable way to get FM6 to ‘send’ data to FM7. I was considering XML and CWP calls, timed export/imports every minute, etc. But someone suggested Troi Activator and I can’t speak highly enough of the solution. It was simple, simple, simple to set up on both sides of the FileMaker divide. And it works across the network with the most incredible behind-the-scenes speed. What I ended up doing was setting up a ‘bot’ machine that runs FM7 with the plug-in, and then the four FM6 machines that need to communicate with 7 also have the plug-in installed. I guess I was expecting some kind of glitch like screen flash or momentary system freeze or something when the plug-in was activated, so I was very impressed — awed actually — that I saw my local copy of 7 (over a WAN connection to the client) updated only a second after the plug-in script was activated on 6 to the 7 bot. Up to 6000 characters of text can be sent along with the plug-in’s script trigger, so no unreliable exports/imports of data were required. Very rarely do I go to any effort to write someone a thank-you note when I purchase their software. However, this time, it certainly warrants it.Your plug-in, “Activator” has saved me – literally – hundreds of hours and an immense amount of heartache in my runtime solution, which is a massive relational system for managing flight operations at one of Canada’s busiest airports. Clint Roberts, Senior Technical Editor for ISO FileMaker Magazine. review from Paul de Halle on VersionTracker. We are still collecting more comments. If you have any remarks on the Activator Plug-in please send us your comments. Thanks! Read how to configure Troi Activator as an Image Upload Server, enabling your FileMaker Pro database to receive images including (GPS) location data. 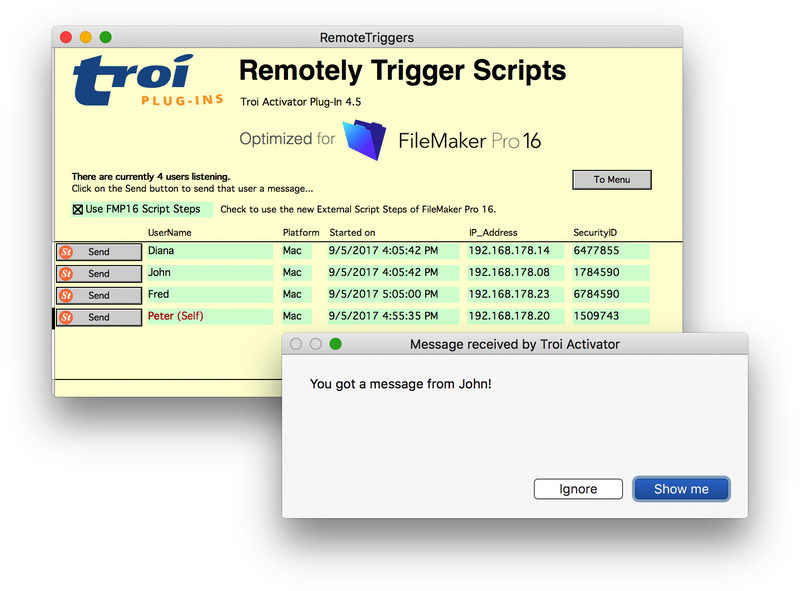 Read a more detailed comparison between native script triggering in FileMaker 10 through 16 and Troi Activator Plug-in. (Older) information on how to convert databases which use the Activator, from FileMaker Pro 6 to FileMaker Pro 7 and later. 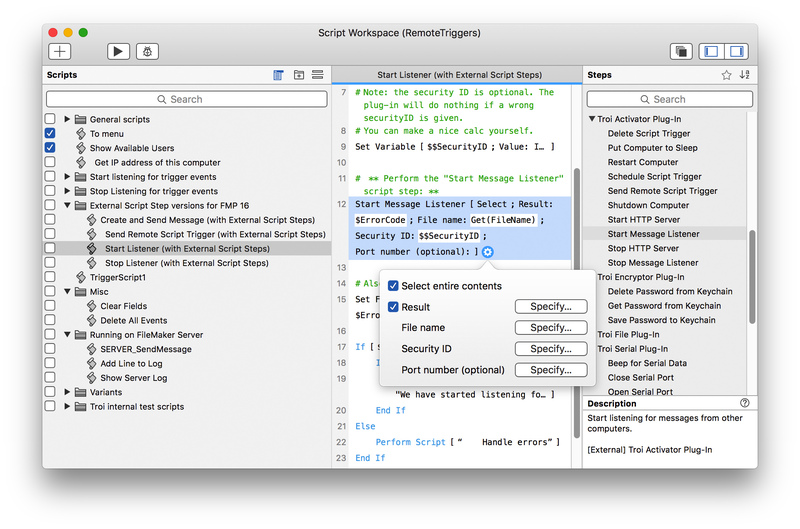 Trigger FileMaker Pro scripts across the network, even over internet!